Born Celesa Chini in 329 ABY on Coruscant to a visiting higher class merchant Pantoran family, Cerez never knew her parents, as they died when she was only 2 years old in the first wave of victims in the devastating plague that burned throughout the galaxy from 331 to 338 ABY, killing an unimaginable amount of people. Raised on the streets of undercity Coruscant under the watchful eye of her aunt, Neliie Kay, and growing up in a time of chaos, Cerez had been known to be mischievous from a young age, and to always find ways to get what she wants from complete strangers. One such incident in CoCo Town caused great havoc when the child attempted to use her newly discovered abilities to cause a diversion and acquire a rich boy’s brand new skimboard, much to the boy’s dismay. News of this incident reached further than expected, and very soon, to Aunt Neliie’s great surprise, a mysterious Jedi Master, by the name of Alehk Thol, appeared on their doorstep offering that the child be taken into custody to be trained as a Jedi Knight under the tutelage of the Jedi Council at their Praxeum on Rannon. With much reluctance, and a surprise visit from the local police to convince her, Aunt Neliie eventually agreed to place the child in the Jedi Council’s care to worlds apart from the shady streets of low-life Coruscant, even if that meant that she would very rarely, if ever, see her again. Rezzy left her best friend, thief, and partner in crime, Pako, behind on Coruscant, and departed in Master Thol’s care for the Rannon Praxeum. At the Praxeum, Cerez met Jel’a Vra, an experienced Padawan Learner who shared Rezzy’s free spirit, and the two of them forged a bond that would last for years in what started out as a ‘business deal’ when Rezzy traded a helping hand for an unlikely skimboard promise with Jel’a — a promise that Jel’a kept. 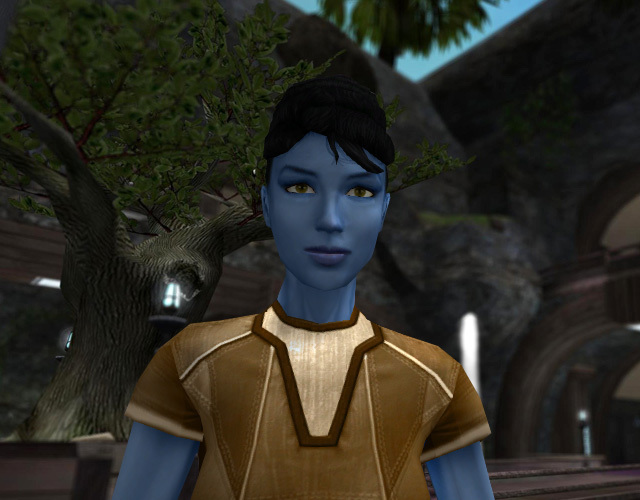 After being formally accepted into the Jedi Order, and a total two-year training period at the enclave, Rezzy was taken by Jedi Knight Jel’a Vra under her wing as her first Padawan. The two Jedi misfits agreed to keep their Master-Apprentice relationship informal.